God, come to my assistance. Lord, make haste to help me. I have to give a short talk tonight. I need to write 1500 words. I went to a cafe and got some coffee and wrote it. It was fine. It gave me pleasure to quote the City of God. Everyone in the world wants the same thing: peace. But you can’t get it unless, instead of aiming for peace, you aim for God. Augustine is always coming up with things like that. Another one I read the other day: goodness is something you can possess only by sharing it; as soon as you try to keep it for yourself, you don’t have any. I walked past an antique store. They had an old three-volume set, very nice, of Boswell’s diaries. I nearly bought them. I stopped myself just in time on the grounds that I already had two editions and still hadn’t read it all. But with Boswell you never feel like you need to read it all. If you are wise you will always save some for later, since never again until the end of the world will there be another Boswell. I read a book on Hellenistic aesthetics, by Barbara Somebody, with lots of photos of sculptures and paintings. I was moved by all those statues showing infants committing violence. 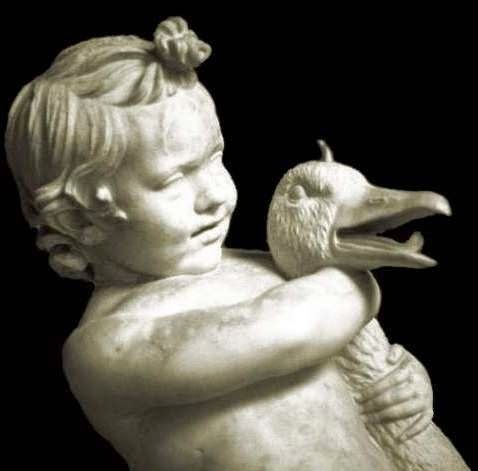 A baby strangling a goose. A baby crushing a duck. A baby strangling snakes in both hands. Also the grotesques: statues of dwarves, hunchbacks, drunken old women. And the beautiful sad slaves. Apparently there is more to the Hellenistic aesthetic than just bad poetry. A minister was telling me all about Tinder, the dating app. You swipe left to reject someone and right to accept them. He did the hand actions on an invisible phone. Then he said he worried that things like this are diminishing our humanity. His cheeks glowed with pleasure. I have noted, with some concern, that lately I have forgotten to be afraid of dying. This has made me more cantankerous. A bit insensitive towards my fellow man. I offended somebody yesterday and I think I might have offended someone else today. These are people I like. (I would never offend a stranger.) I wonder if this could explain the famed irritability of our Christian monks and ascetics. Without the fear of dying one runs the risk of becoming just a little bit cranky and unkind. Missed my afternoon nap in my study. So I snuck into the chapel while no one was around and lay down on the floor for ten minutes. Lying there in the big clear silence, not ten feet away from the baptismal font, my reveries were shattered by the sound of three text messages arriving in my phone. Without checking to see who it was, I wished them harm. In the sacred stillness of the chapel I cursed the sender of the messages and wished them harm. I had a conversation with a gentleman who loves the novels of Roberto Bolaño. I told him I respect Bolaño, I have read them all, I thought 2666 was tremendous. But love Bolaño? I can’t quite imagine what that would mean. He said, “What about Cormac McCarthy then?” I could tell that we would never see eye to eye on this matter. We talked about Flannery O’Connor, who once said that she had gone to someone's house and they had shown her a chicken that could walk backwards. Flannery O’Connor would have been right at home in the town where I grew up. In the car I am listening to an audiobook of Burke on the French Revolution. I love the eighteenth-century English sentence. It is always full of surprises, if you can pay attention long enough to hear the whole thing out. The nineteenth-century sentence is a different matter. It is like the champagne after the party is ended. The glass is warm. All the bubbles have gone out of it. Drinking it doesn't alleviate your misery but only deepens it. I stopped on the way home to pick up a pizza. The girl at the counter is pretty in a sultry, inaccessible sort of way. She has a mouth like Scarlett Johansson. And that’s saying something. It is always a pleasure to hand her my credit card. If you pressed your face into her hair it would smell like pizza dough and oregano. But they don’t like it if you behave that way when you’re paying for your pizza. I paid for it and waited, watching an old music video on a big TV above the drinks fridge. The sound was turned down and I kept trying to remember the tune, but in my head it kept getting mixed up with the tune of “Happy.” Then the pizza guy came from the kitchen with the pizza. Unlike most people in his station in life, he looked me full in the face and smiled at me and said my name. He was a middle eastern kid, Lebanese maybe, with one of those thin Muslim beards, and when he handed me the pizza I could have sworn he had the face of Jesus. Or maybe he was just grinning like that because he gets to work with Scarlett Johansson. My daughter is sick. In a household of this size there is always someone who is sick or down on their luck or torn by a moral dilemma. She woke again just now. I gave her some medicine and put her back to bed. The dog is sleeping in solidarity beside her. He has a better life than any of us, yet he is always the first to sympathise with any human misfortune. Once he ate twelve eggs from a carton that was left out on the table. Once he ate a whole packet of biscuits. Once he ate three chickens. We didn’t give him any sympathy, I can tell you. But when a child is sick he is always the first to lick their face and to lie down on the floor beside them and to stay there through the night, just in case they wake and reach out in the dark and need to feel something strong and reassuring at their side. Day and night I cry to you, my God.